Kellly has been an INW customer since 2008. Kelly has found the design of brokerage services flexible enough to access services catered to her specific support needs. Kelly has severe food allergies, so was thrilled to find a provider who helps her shop, read food labels, find recipes, and cook. In the past, if she accidentally ate something she was allergic to, she said, “I would get really sick. And it does take me a while to get back on my feet after I am contaminated with the food that I am allergic to.” A favorite recipe she discovered with her provider is a gluten-free vegan clam chowder that “tastes like the real thing, only with coconut cream and sweet rice flour.” This brokerage service “really helps me out,” she says. Another unique service Kelly has access through the brokerage is the ability to attend the national Turner Syndrome conference each year. “I have Turner’s. I like to go to these conferences that happen every year. And the brokerage pays for that, which is really nice.” While Kelly saves money to afford a plane ticket and hotel room, her brokerage service plan covers the cost of her conference registration so that Kelly can network with hundreds of people affected by Turner syndrome and go to workshops and presentations given by healthcare providers and other professionals. Another part of her brokerage plan that Kelly states is very valuable to her is transportation services that allow her to get places she cannot access independently. The individualized services outlined in Kelly’s annual support plan are entirely unique, and as Kelly points out, different from other brokerage customers. “I live out on my own—not everyone I know lives on their own. Not everyone that I know has food allergies, not everyone I know has Turners, or the same kind of medical conditions. I don’t know anybody else that gets the same kind of services that I get,” Kelly says. Kelly is an avid user of social media. “I like posting all the stuff that I do, posting activities with On-the-Move, saying what I did at work… my family likes that I post things on Facebook so that they have a good sense of what’s going on.” She also posts personal memoirs and original creative writing on a self-publishing internet site, and makes short movies that she posts on her youtube channel. She observed that her interest in communicating her experiences through these different media increased as she has become more involved in her community, particularly through her community inclusion program. “When I started going to On-the-Move I thought, that’s interesting… this part is interesting to ME. And it’s something special that happened to me.” Having interesting, novel experiences that are independent from her family give her rich experiences that Kelly defines as key to a good quality of life. Excited to continue with advocating for individualized services and support for adults with intellectual disabilities, Kelly has already planned another trip to Salem and is joining the Board of Directors of a local Portland nonprofit. She said she would make the following recommendations to anyone just entering the brokerage system: “I would definitely tell them about On-the-Move, I would tell them that if they have any medical issues then tell your PA. If you need assistance with financials, speak up, don’t be shy, because that’s what they’re there for. When I first started, I wasn’t quite sure what to ask, or what was even available. 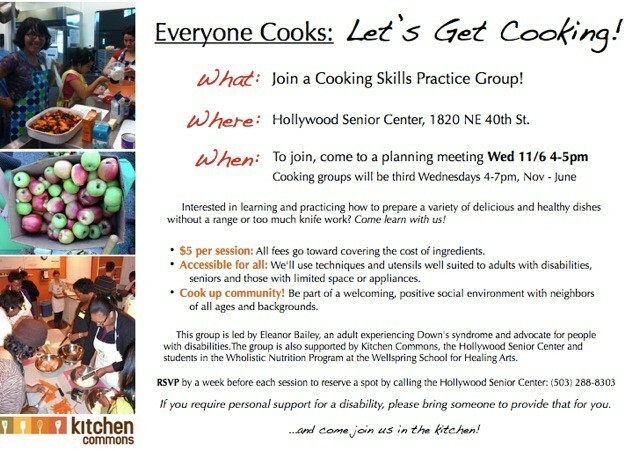 I wasn’t quite sure if I could get help with learning how to cook, and what kinds of things would help me out when it came to community, things like that. The medical stuff is especially important,” Kelly says, referencing transportation services, adds, “and going to places that I cannot get to.” Having access to services that are uniquely individualized to her specific needs and circumstances has been life-changing for Kelly. “Yes, it’s really important!” she says. You can read Kelly’s stories on fanfiction.net (fanfiction.net/u/37688/kellyQ) and wattpad.com (wattpad.com/user/kellyq204) and see her videos on her youtube channel (youtube.com/user/kellyq204). 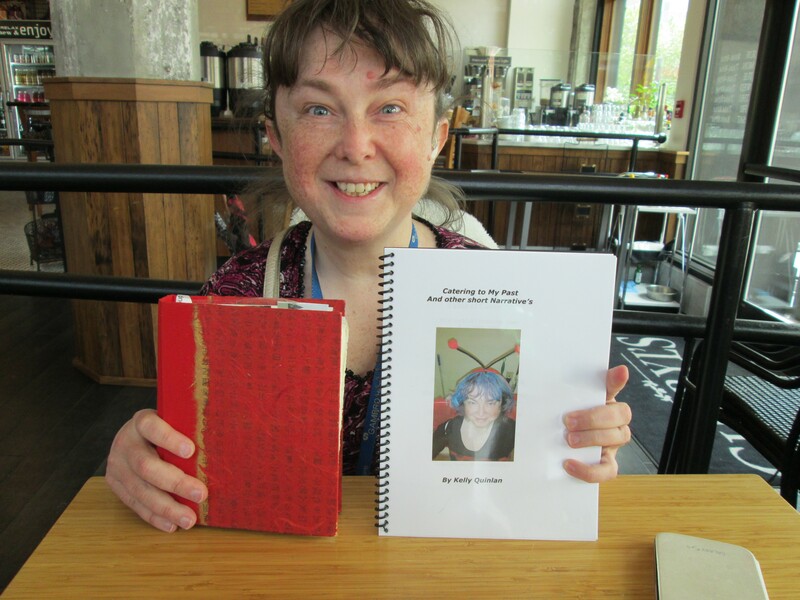 This is the first of the Independence Northwest Customer Stories Project, an effort we’ve recently begun in collaboration with disability community leader Molly Mayo. We believe that hearing/reading the life stories of those who receive our services will deepen community understanding of the uniqueness of essential home and community-based brokerage services. As our system continues to wrestle with changes, we must keep the principles of self-determination front and center. There’s no better example of someone taking services and running with them than INW customer Henry Meece. You may recognize Henry from many of INW’s promotional materials. His face graces our Facebook page and several of our published documents. Henry is living quite the life and has a memorable story to tell! Henry Meece has been a brokerage customer since 2009. He uses brokerage dollars to purchase Day Support Activities/Attendant Care, Supported Employment and Relief Care. His Personal Agent is Carie Shumway. Henry was adopted by Nancy Newell and Ted Meece in 1990. 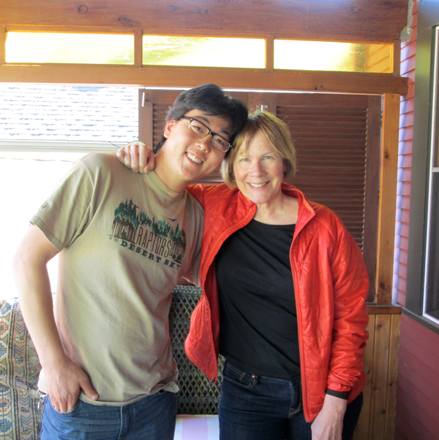 His parents knew that Henry, an orphan from Korea, would probably have a disability. He began early intervention services at age 18 months and was in special education throughout school, graduating with a modified diploma when he turned 21. Although frequently in segregated classrooms, Henry experienced true inclusion in sports programs and “competed right alongside his peers” his mom states. But once school ended, without regular, structured activities, the family at first had no idea what Henry was going to do. Brokerage-facilitated supports have been instrumental in matching Henry to meaningful employment. Using supported employment services, Henry has been able to gain significant experiences building an employment resume, and as a result successfully obtained two part-time jobs. He has worked at a nonprofit brew pub for three years, and at a fitness center for the past year and a half. “I like everything,” Henry says about his jobs, which total about 10 hours per week and pay minimum wage. “I want to get the money,” he says, to put into a savings account. Nancy and Henry appreciate how brokerage supports are uniquely individualized to each person. But such open-ended options have at times made the system challenging to grasp. “It’s great to have individualized systems, but there is no uniformity,” which can make things confusing, says Nancy. “It’s a wonderful system, but how do you know about it? We’ve learned as we go along, and the information can be very difficult.” Nancy has found dealing with employment issues especially challenging, because when Henry earns an income, it affects his Social Security benefits and requires detailed documentation. “Everyone should work if they want to, and everyone should work if they can. But there are a lot of reasons not to work,” says Nancy, referring to the complex rules around earning money while receiving Social Security benefits. Before Nancy had a clear understanding of the needed documentation, which requires writing a letter to Social Security and submitting all of Henry’s pay stubs each month, she says, “I felt like a fool—the college educated mom! …You know we are doing just a bit more than waving goodbye—we’re orchestrating. We’re like an air traffic controller keeping everything in the air and trying to have everything land smoothly. So I think it is very hard to carry all this information around… and if you have one lapse,” there can be dire consequences, Nancy points out, such as the entire loss of eligibility for much-needed benefits. Nancy and Henry describe their experience with Independence Northwest brokerage as smoothly functioning and “highly efficient. Everything behind the scenes works. The relationship between the brokerage and the providers seems to work really well. I have never had to be involved in a billing issue. Henry has never been turned away because papers weren’t signed. The relationship between the brokerage and the providers has been very strong.” Additionally, Nancy adds, “the PA [personal agent] will sit down with Henry in a way that he understands. I can be involved or Henry can get to the PA independently.” Henry has chosen to use Independent Contractors, small local agencies, and larger organizations for various services as his needs have changed throughout the years. The 2013-15 HCW/PSW Collective Bargaining Agreement provides for a new level of worker and compensation. Enhanced and Exceptional Workers provide services to consumers with certain assessed medical and/or behavioral needs, AND have successfully completed additional training. 2. Go to the website: ohcc-training.org. Create an account, then log in to your account. Look under “Courses” for the Readiness Assessment for your work group (HCW or PSW). 3. You are allowed to take the Readiness Assessment one time only, so some study ahead of time will be helpful. It is highly recommended that you review course manuals from the classes you have attended that are listed on the website if you have taken them. 4. Complete the Readiness Assessment. You will be able to review your answers after you finish the assessment. 5. If you pass the assessment with a score of 80% or better, you will be directed to the application. Fill this out and send to the Home Care Commission. These must be received by October 20, 2014 to be eligible for the pilot course. If you do not pass the readiness assessment, you can use the feedback online to determine which topics to learn more about or courses to attend. The assessment will open again in 2015 the next time the course is offered. Effective 09.01.2014, the State of Oregon Office of Developmental Disabilities has made significant changes to day program, sheltered workshop, and supported employment services offered by provider organizations. Please see below for some Frequently Asked Questions related to the September 2014 transition and translation of Day Support Activities and Employment Activities. What is DSA? DSA stands for Day Support Activities. This is a new title (with new rates) for a subset of services offered exclusively by provider organizations. DSA includes both attendant services and skills training and may be provided in either a facility or the community. Why is this change being made? The State is aligning rates and service descriptions across both brokerage and 24/7 comprehensive services. Unfortunately, brokerages and brokerage-specific providers weren’t included in the planning for this change, which has resulted in a rocky implementation process. What’s changing? Effective September 1st, 2014, many traditional services (like Community Inclusion and Skills Training,) when provided by provider organizations, will be collapsed into the new DSA heading. There are rate changes associated with this change. Further, these services must now be billed through Oregon’s online payment system, eXPRS. What’s happening with Employment Services? Employment services and rates have been adjusted and amended as well. As with DSA services, billing will now go through eXPRS for services provided September 1st, 2014 forward. Where did the new rates come from? 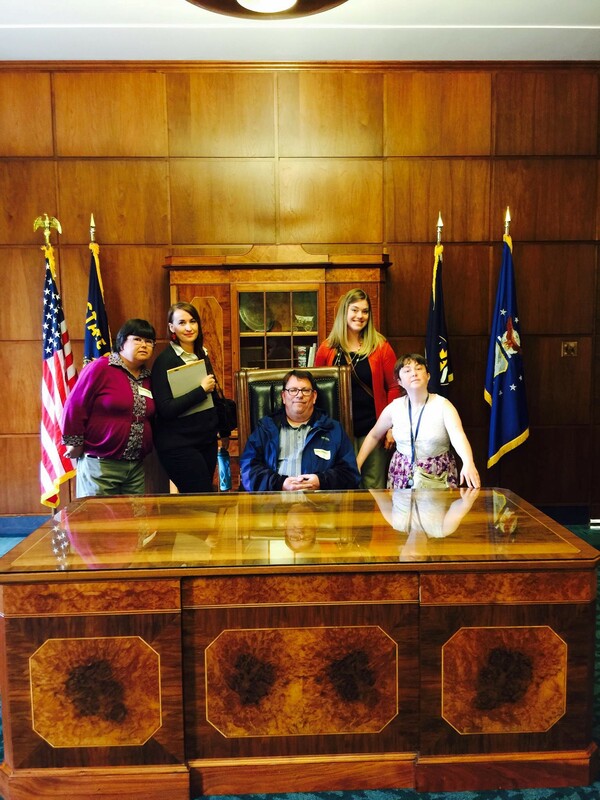 The rates were determined by the State of Oregon Office on Developmental Disabilitiesas part of its ReBAR efforts. Are these rates and definitions permanent? We don’t know. The state has pulled together a workgroup, set to begin meeting in late September and through October 2014. The workgroup has provider organization, county, brokerage, customer, and family representation. The group will give recommendations for everything from rates to service definitions. The first meeting is on September 29th, 2014. Do provider agencies charge the same rate for every customer? No. Each customer has an individual rate based on his/her assigned Tier. The Tier is determined by the Adult Needs Assessment his/her Personal Agent conducts prior to ISP planning. Can Personal Support Workers or Independent Contractors provide DSA? No. DSA is a provider organization-specific service. Similar services are provided by other provider types, but they are labeled differently and have a different set of rates. What if my agency isn’t in eXPRS? You should contact Julie Harrison or Acacia McGuire Anderson directly. You need to ensure you have a properly set up provider number. What’s a Medicaid provider number? A Medicaid provider number is assigned to you by the State. You must have a Medicaid provider number in order to bill in eXPRS and be paid for certain services provided September 1st, 2014 forward. If you provide DSA or Employment services to brokerage customers, you need a provider number ASAP. Brokerages can no longer pay you directly for these services. Nate Deeks and Acacia McGuire Anderson are responsible for assisting provider organizations having trouble with this particular issue. What services to brokerage customers will be billed through eXPRS? For services PROVIDED September 1st, 2014 forward, all DSA, employment and employment path related services will be billed and paid through eXPRS. This includes: Day Support Activities, Individual Supported Employment, Small Group Supported Employment, Discovery/Career Exploration, and Employment Path Services. What are the steps a provider agency needs to take to get paid for DSA and/or employment services? The provider agency must log into eXPRS, find the specific customer for whom services was provided, locate their active Plan of Care, then bill against that Plan of Care. 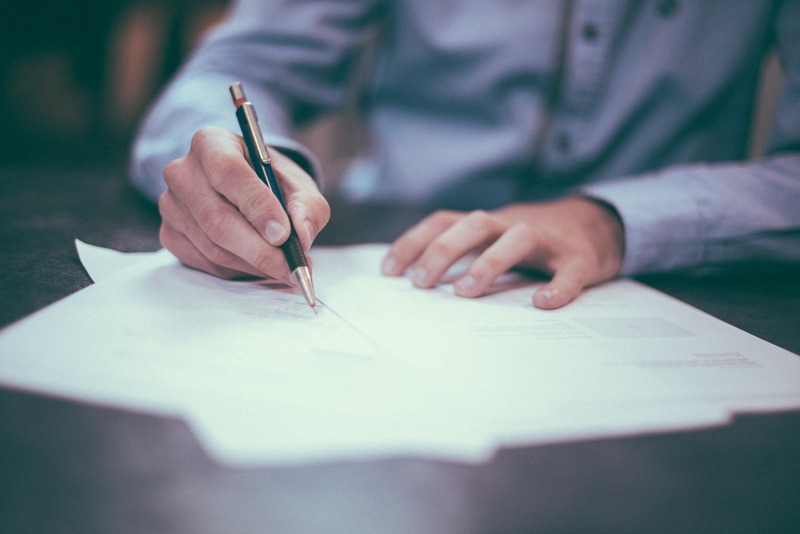 At the same time, the provider organization must send a copy of their customer-approved invoice and progress notes to the Personal Agent (as you always have.) From there, brokerage staff will review your invoice, go into eXPRS and give the state the thumbs up to release payment. Will provider organizations receive new service agreements from INW? INW will not be sending new service agreements, but will send you a translation document which amends the current agreement. If you require additional documentation, please call us directly. Do I have to submit an invoice to the brokerage anymore? Yes. You should submit your customer-approved invoices and progress notes to your Personal Agent as you always have. Nothing has changed there. Brokerages are not a pay and chaseenvironment. Can I bill for two different services on the same invoice? Yes, you can, but you’ll need to itemize and clearly spell out the differences in services. Are there changes to what provider organizations can/cannot bill for? One large change is that provider organizations cannot bill for miles driven while concurrently providing Day Support Activities. Are DSA services pro-rated? No. DSA services are never pro-rated, regardless of the number of people served at one time. Why are services in eXPRS limited to a monthly allotment when brokerage plans are written at an annual allotment? We hope this will be corrected in eXPRS very soon as it is already causing issues for providers and customers. We have a commitment from the new DD Director that annual authorizations are allowable in the system. In the meantime, the monthly limit in eXPRS creates a false restriction of services (counter to how plans were written.) If you see that the monthly restriction is too tight for a customer’s actual utilization (but keeps within the customer’s annual contracted agreement with you) give us a call and we will work towards correction in eXPRS. Thanks for your patience while this gets sorted out. What happens if I submit “old” invoices for services provided before September 1st, 2014? Those services will not be billed through eXPRS. So, you can skip going into eXPRS and just send the bill directly to your PA. Payment will come via direct deposit or paper check from Independence Northwest. What if I run into issues with billing? Please call Larry Deal (503.546.2950 x10) or Ron Spence (503.546.2950 x12.) We will respond to provider organization issues within 1 working day. Our aim is to work with providers to clear up issues as soon as possible. 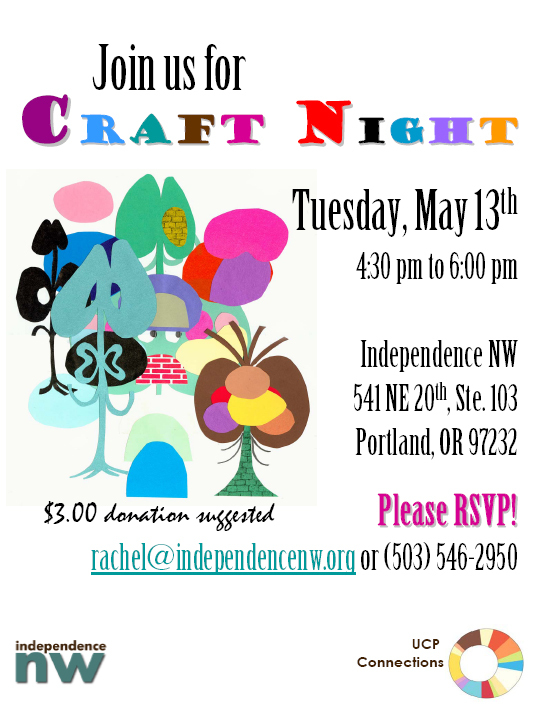 Please join us for Craft Night on Tuesday May 13th, 2014 at Independence Northwest. We suggest a $3 donation, but no one will be turned away. Our office is located at 541 NE 20th Avenue Suite 103 in Portland. 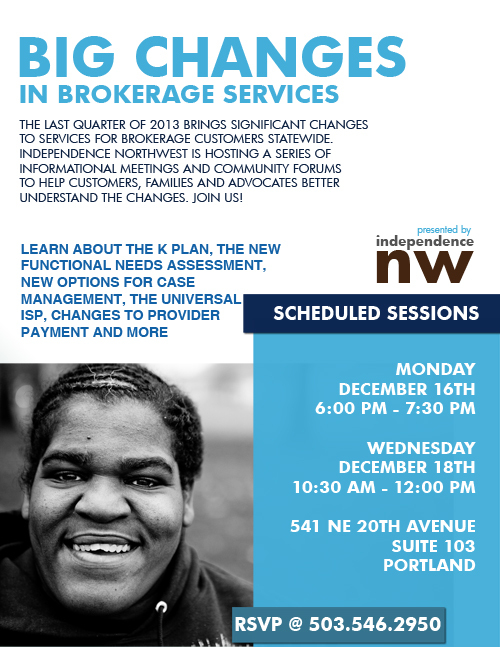 You may RSVP by calling 503.546.2950 or emailing Rachel at rachel@independencenw.org. Please note: if you require support to participate, please bring someone to assist you. Providers may be paid via brokerage funds to provide disability-related support. The Oregon Support Services Association (OSSA) is pleased to announce the hiring of Kathryn Weit as our Executive Director. Kathryn is well known as an advocate and leader for services to people with intellectual and developmental disabilities. Her extensive history in our State includes participating in launching the Oregon Support Services Brokerage system, leading the Oregon Developmental Disabilities Coalition and serving as the Executive Director of the Oregon Council on Developmental Disabilities. Kathryn is reachable at KathrynWeit@oregonsupportservices.org and 541-520-7461. Our first blog post of 2014 is an important one. Late in 2013, word came from the Oregon Office of Developmental Disabilities Services that they were planning to significantly reduce Small Group Inclusion and Skills Training rates paid to provider organizations. Upon review, brokerages immediately responded explaining such a decision would put many small business completely out of business, reducing key resources for our customers statewide. 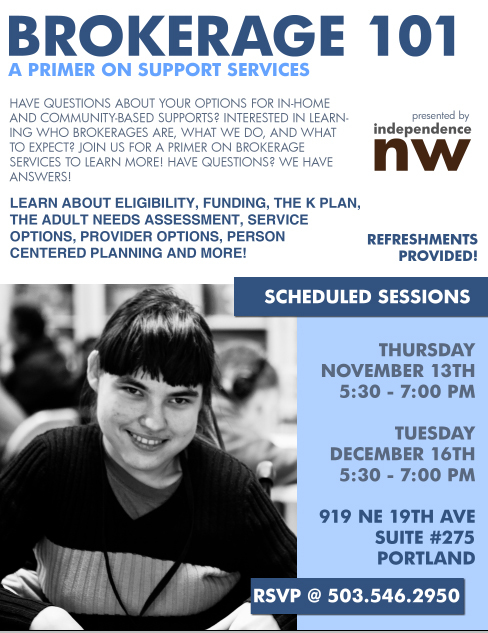 In the weeks since that exchange, small provider agencies in the Portland metro area (led by On The Move Community Integration, Creative Goal Solutions and Trellis) have come together to form a grassroots coalition (known as The Coalition of Provider Organizations.) Their aim is to educate the state, legislators and the general public on their services and fight the potential reductions in rates. The group developed a comprehensive white paper on their concerns (read it here: Provider Organization Coalition Paper) and, in December of 2013, presented to and gained the support of the I/DD Coalition. As a result of their efforts, state leadership has agreed to meet with some small agencies this week as they reconsider the rates. Our understanding is that the state will need to publicly share their methodology and reasoning and has committed to entertaining stakeholder input and education throughout the process. Given the stakes, full engagement is key. Sasha Vidales, Director of Creative Goal Solutions, one of the most sought-after agencies in the Portland area is today’s guest blogger for the Independence Northwest blog. Below, she shares what this all means from a provider organization, small-business owner and concerned community member perspective. While Oregon is moving to the K-Plan, many customers are seeing increased access to funding for their services. But simultaneously, provider organizations’ hourly rates are slated to be cut by almost 18%. Perhaps most affected by these cuts are smaller, local, grass-roots organizations who have sprung up in response to the diverse needs of brokerage customers; programs like Creative Goal Solutions, which I started in 2011 to offer fully-integrating community-based services to adults with developmental disabilities. Already operating on a shoe string budget and my personal investment, the proposed rate would unquestionably force Creative Goal Solutions to close its doors within just a couple of months. The greatest detriment would be to the individual customers served by Creative Goal Solutions, customers like Annie Rose. When Annie Rose started working with Creative Goal Solutions, she had the same goals as most twenty-somethings—to move out on her own, get a job, have new life experiences, and exert her independence. Through working with CGS, she had the opportunity to explore her greater community in a group setting. “I like Creative Goal Solutions because it gets me out of the house. I like meeting new people. I discovered new foods…I enjoy going to the park… camping was lots of fun. I like going to the library and art showings.” Soon after her start, Annie decided to move into her own apartment. CGS staff helped her establish a routine around cooking and cleaning that would increase her success as she transitioned. Knowing the importance of community connectedness, staff also helped Annie explore her immediate community on foot and on bus to find new hang-outs. She now independently works out at her local community center and has some favorite local shops and cafes, all the while staying involved in CGS’ group community inclusion. A while later, Annie also took on various volunteer jobs. With staff support, Annie Rose works alongside community members and other customers to gain job skills and give back to her community. “I like doing Zenger Farms,” says Annie Rose, “I really like gardening and don’t do enough. Now I get to go out once a week and it’s a relief. I’m suddenly happy! I’ve noticed the weeds have gotten enormous and tough to pull out. I’m proud that I can pull them out.”Annie is just one of the over 40 customers flourishing with the support of Creative Goal Solutions’ unique service model. When I started Creative Goal Solutions, I was excited to use innovative strategies to develop meaningful, community-integrating experiences for our customers. I envisioned services that would empower each customer to become involved citizens and create meaningful visibility for themselves. Over the past two and a half years, I’ve assembled a team of highly creative, motivated and skilled employees to put this vision into action. Now, we boast a diverse array of programs to accomplish that vision.What I didn’t realize upon CGS’ inception, was the tremendous value of the group-model. Customers learn so much from each other and there is often a lot of camaraderie, connectedness and natural support developed. At the same time, the model differs drastically from facility-based models in that customers are making daily, “real-life” contact with their communities through recreation and volunteering. Many customers and parents, including Laurie Burk, have noticed the difference. “[The facility-based program he attended prior to CGS]… provided little or no outside community activities. There was nothing special about the program. I likened it to a daycare center. Since attending CGS, he has shown much improvement. We believe this to be directly related to attending outings to places that “regular” people go. I don’t think many people who are not affected by developmental disabilities understand the secluded life of a young person with disabilities and what they face day in and day out… Just because he has a disability doesn’t mean he doesn’t have worth.”Our Volunteer Program connects and teaches customers at six different community organizations, including The Rebuilding Center, SCRAP, Hoyt Arboretum, Impact NW, the Bike Farm, and Zenger Farms. All of these sites give our customers job-like experience where they can gain skills and confidence working right alongside community volunteers. The program has been tremendously impactful in our customers’ social well-being and sense of worth and individual contribution. We also provide fully-integrating recreation experiences. The programming is diverse, offering many activities not commonly accessible to people with developmental disabilities. We fill the monthly calendar with customer-preferred activities, such as bowling and libraries and unique experiences, such as attending the Feast of Guadalupe concert, Leech Botanical Gardens, and a tour of the Human Society. We also offer a Nightlife Group. Through this, many customers have their first experiences going to activities like stand-up comedy, salsa dancing and pub trivia. Additionally, our camping trips afford customers the opportunity to be away from home with a group of friends and foster budding friendships through exploring nature. Despite our customer’s successes, we’ve experienced significant barriers when it comes to a functional and sustainable business model, having to fit a square peg in the proverbial round hole. Our program model of fully-integrating group experiences does not fit well in the current provider rate structure. Most traditional services are provided with one staff per one customer or take place in a facility. Our services don’t fit either of those models and our way of providing services comes with substantial added costs as well as barriers to be able to bill for the full rate. Despite these barriers, we’ve persevered. We’re proud to be one of the handful of truly unique, local, grass-roots organizations with truly unique services to offer. It’s hard to imagine the local impact of all of these customers losing the visibility and community presence that we’ve worked so hard to promote. Observing our customers’ growth in confidence and self-efficacy over the past two years has been one of the most impactful experiences of my life. Equally important, I’ve seen our community’s response to our customers. I believe that through our work, we’ve begun to shift how people understand disability. They are witnessing all that people with developmental disabilities are capable of contributing, and, with time, learning how essential they are to the fabric of our community. We’ve accomplished a lot in just over two years. I have many more ideas that I’m actively implementing: a self-employment program, a healthy lifestyles group, and leveraging our culturally-competent, 50% Spanish-speaking staff to better engage Latino customers. Yet, my intense passion and enthusiasm is met with a very real possibility of closure. I’m working hard to push back against the proposed cuts. I’ve co-formed a coalition of small provider organizations, including On-the-Move Community Integration and Trellis to express our alarm and the potential impact of cuts. We’re meeting with decision-makers at the State level as well as other affected provider organizations. I am also counting on the support of families, professionals, self-advocates, community members and the decision-makers at DHS to halt rate cuts and make the growth and development of our innovative program, and others like it, to flourish… for the betterment of our customers and the betterment of our communities. Sasha Vidales has worked in community services for 14 years in mental health, policy research, training development, case management, quality assurance and other capacities. She has a BA in Psychology and an MBA in Organizational Behavior and is trained as an Autism Specialist and Social Sexual Consultant. Sasha founded Creative Goal Solutions in 2011 because of her belief in and commitment to strong communities. She knows that strengthening communities requires meaningful and full integration for all people. If you are interested in learning more or joining the coalition, contact Sasha at sasha.vidales@creativegoalsolutions.org. There continue to be hold-ups on the State’s move to take over payment to providers of brokerage services. We will continue to provide your payment until an appropriate plan is developed and agreed upon. Given the amount of work left to do during implementation, our best guess is a transition several months into the new year at this point. If you haven’t sent in your Provider Enrollment Agreement, do so now. This is an essential action on your part, regardless of changing timelines. If you have turned in your PEAA and have received no response back from the State, contact them directly at DD-MH.OHCC@state.or.us. (We initially thought we would be able to send out emails for those who had provider numbers, but the information we have received from the State isn’t in a format that allows us to do so given our limited resources.) Please email the State for assistance on this matter. Finally, provider organizations who need a provider number should be hearing from the State shortly. We are aware of a transmittal being developed and have heard it should be out within the next week or so. Unfortunately, the State has not provided a phone number to field your questions. If that changes, we will update you and share the resource. We will continue to update you as we have more clear information. Thank you for your continued patience during this process. Rest assured that your payment will continue to come through us in the interim while these bureaucratic and procedural tangles are dealt with. 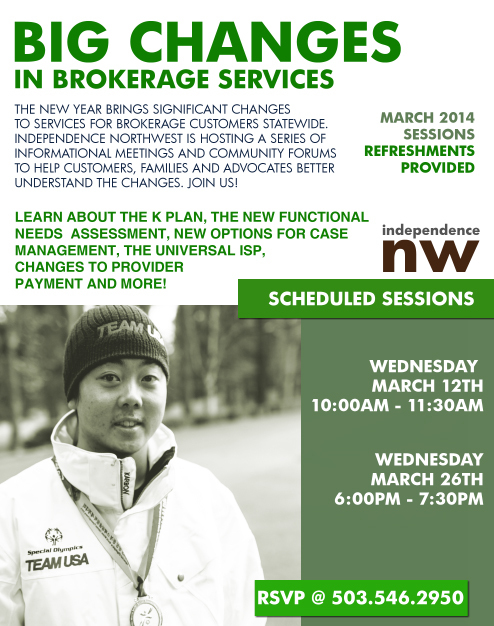 Independence Northwest continues its community outreach on big changes to brokerage and I/DD services in Oregon. Since August, we’ve held many highly successful community forums presenting to over 300 community members – and we’ve got two more scheduled for the month of December! Join us if you’d like to learn more about the K Plan, the upcoming needs assessment requirement, new options for case management, plans for a new universal ISP, changes to provider payment and rates and much more. Remember to RSVP by calling our front desk 503.546.2950. 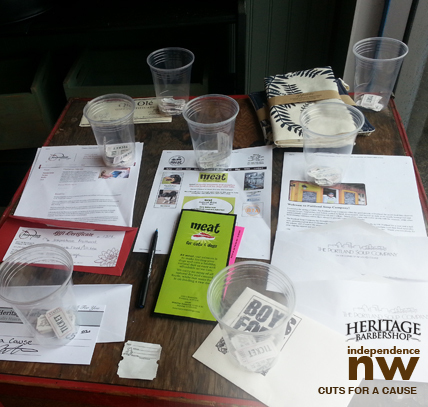 You may also email us at larry.deal@independencenw.org. Space is limited, so reserve your space at one of our evening or day sessions today! Big thanks to all the families, customers, providers and community members who have joined us in the past few weeks. Your questions, comments, concern and input continue to make a difference in the restructure of the I/DD system! 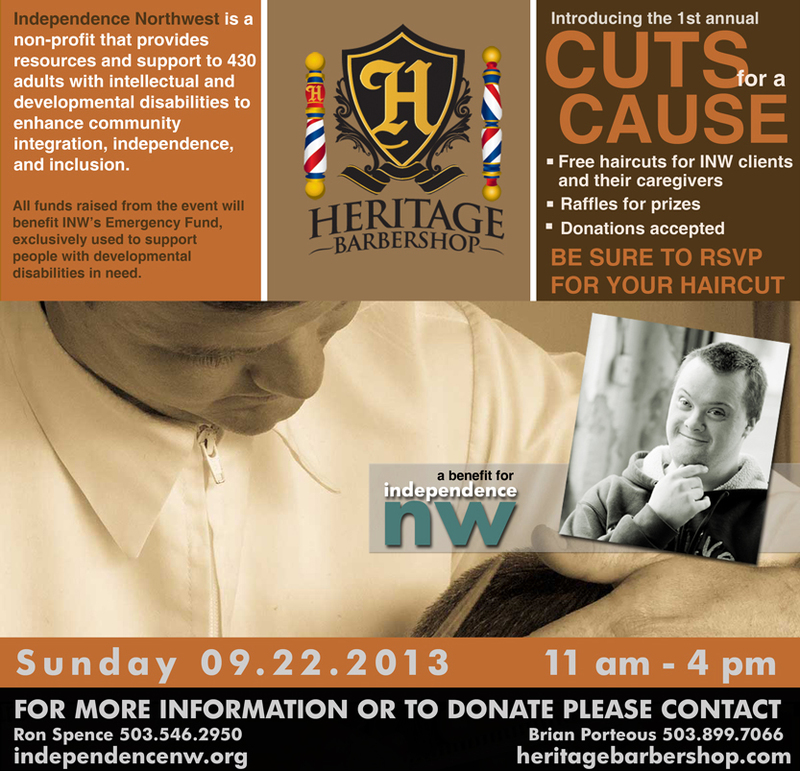 We’re proud to announce what we hope will become an annual tradition: Cuts For a Cause, an event on Sunday, September 22nd, that will offer free haircuts to our customers and their caregivers and will raise money for our emergency fund, a small pool of money we keep to help out our customers in times of extreme need. We will be partnering for this event with Heritage Barbershop, a newly-opened business that has generously offered the time and talent of its barbers to make this event possible. Space is limited and must be scheduled ahead of time. Please call Rachel at our office (503.546.2950) to schedule an appointment. If the free haircut slots fill up we’d still love it if you’d stop by and say hello. We’ll have free popcorn and will be having drawings for prizes every 30 minutes or so. And of course we’ll be accepting donations from those of you are able to give a few dollars to what we think is an important cause. 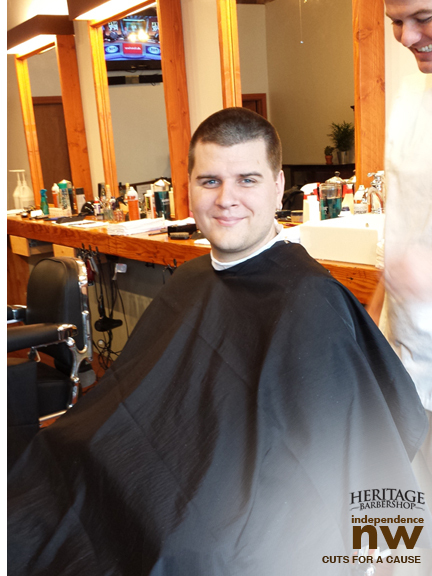 We can’t thank Heritage Barbershop enough for their support and generosity and look forward to a long partnership with Brian and his barbershop. Remember, all free haircuts must be schedule ahead of time. Please call today to reserve a spot. Contact Rachel at 503.546.2950. 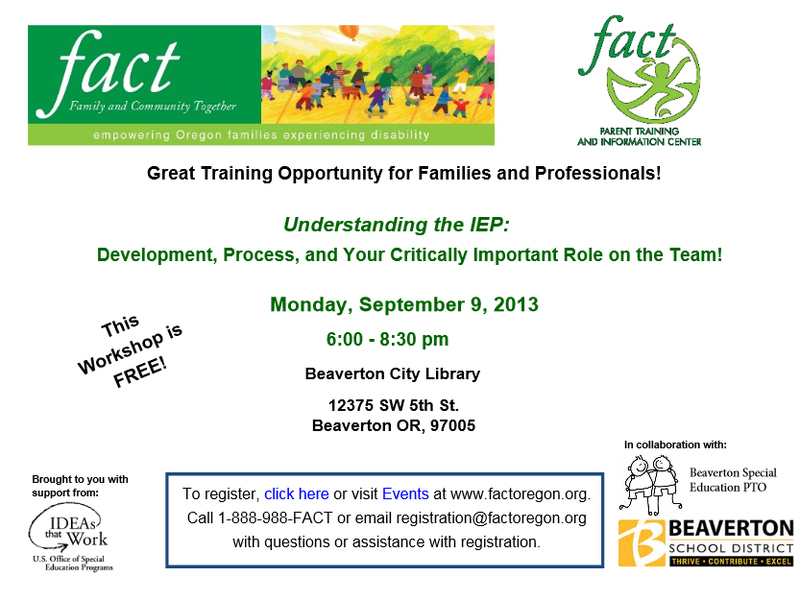 Beaverton City Library12375 SW 5th St.
Informational flyer (in English)To register, click here, call 1-888-988-FACT, or email registration@factoregon.org with questions or assistance with registration. Note: This forum is at capacity and is no longer accepting RSVPs. Keep an eye on our blog for future announcements! 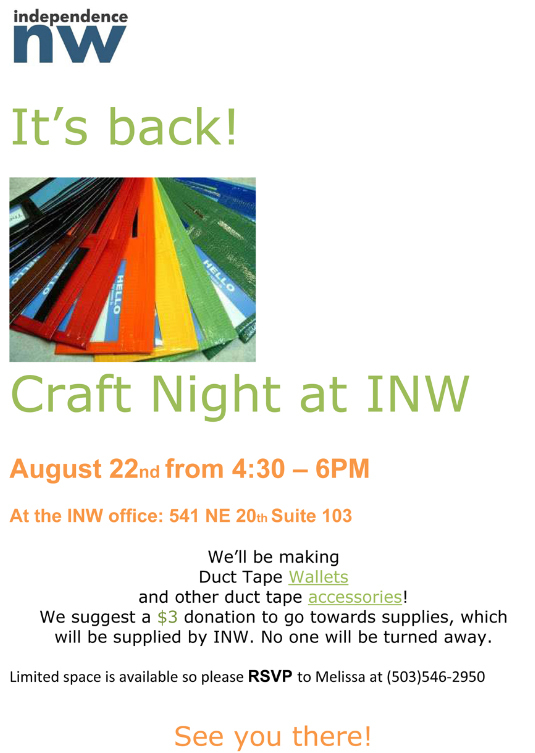 August 22nd, 2013: INW Craft Night Returns! Join Us! 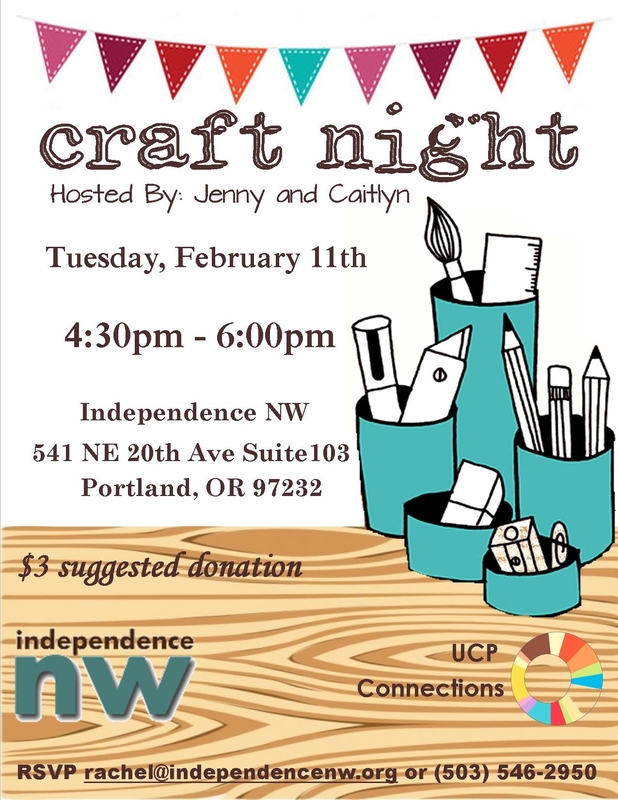 Craft Night returns to Independence Northwest! Join us on August 22nd from 4:30 – 6:00pm here at the INW office (541 NE 20th Avenue Suite 103 in Portland). We’ll be making duct tape wallets and other duct tape accessories. We suggest a $3 donation to go toward supplies, but no one will be turned away because of inability to pay. Space is limited – please RSVP to Melissa at 503.546.2950 and we’ll see you there! 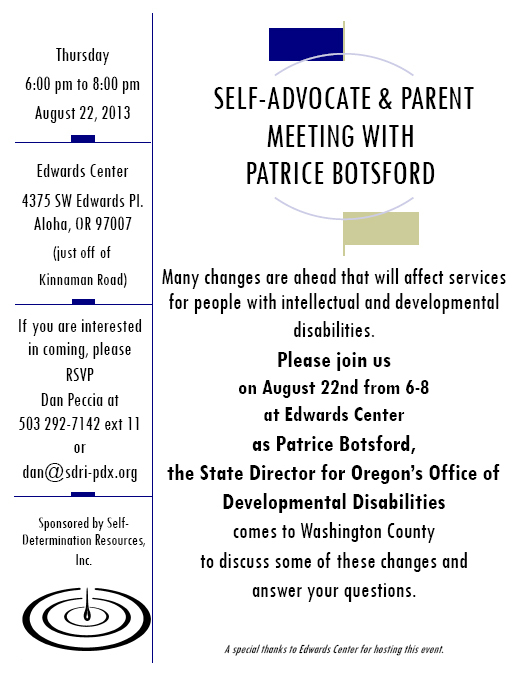 Announcing an upcoming self-advocate and parent meeting with Patrice Botsford, State Director for Oregon’s Office of Developmental Disabilities. Many changes are ahead that will affect services for people with intellectual and developmental disabilities. Washington County brokerage SDRI is hosting an evening discussion on August 22nd from 6 – 8pm. Join them to discuss the changes and have your questions answered! The meeting will take place at Edwards Center: 4375 SW Edwards Place in Aloha. 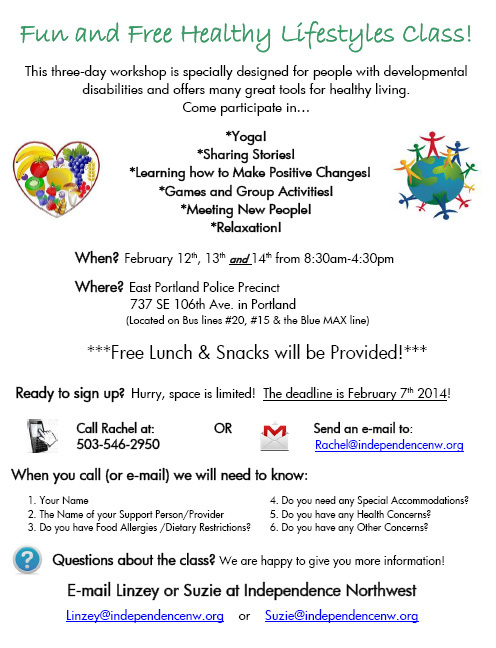 Be sure to RSVP to Dan Peccia at 503.292.7142 x11 or dan@sdri-pdx.org. Thanks to Dan, SDRI and Edwards Center for pulling this important evening together.